She received her dentures 15 years ago but unfortunately couldn't wear them. 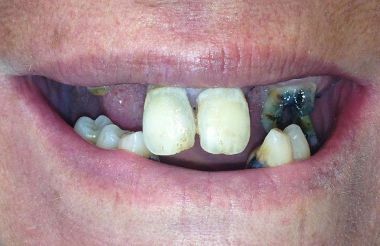 This lovely female patient has not visited her local dentist for years, as previous traumatic dental experiences caused her to develop dental phobia. She received her dentures 15 years ago but unfortunately couldn't wear them. Since then her teeth got worse. She wanted to have her teeth done, but she did not take the first step until recently because she was so scared of the dentist. She couldn't eat and smile properly, but her tooth pain became unbearable and finally she made her decision to visit us.She also experienced hair loss and pain in her shoulders. She even visited a rheumatologist to check her sore shoulders. She was told to have them relaxed, but the pain remained constant. She took more and more painkillers without appeasing her symptoms. She read one of our articles that teeth and bone inflammation have a negative effect on other organisms of the human body, causing issues such as hair loss, pain in the shoulders, digestion and heart problems. At the same time, she read another article from us about IV sedation helping patients to overcome their fear. She thought it was worth going for a consultation, so she contacted us. During the consultation she was told that she would not feel any pain during the major treatment, so a few days later she decided to undergo her treatment.She turned out to have periodontal gum disease. All of her teeth were in a severe state of inflammation, which was likely to be causing her shoulder pain. On the first day, all of her upper teeth were extracted (3 teeth+4 roots,) and she also received extraction on her lower jaw (8 teeth+3 roots).After extraction the inflamed gum tissues were removed and the infected areas were cleared up, she received 9 immediate loading implants (BCS implant) on the upper jaw and8 BCS, KOS implants on the lower jaw. The whole procedure took only 2.5 hours and thanks to IV sedation, the time appeared to pass quickly. The pain in her shoulder had already appeased a lot, 3 days after her treatment. On the fifth day, two 12 -unit bridges in the upper and lower jaw were put in place. After this, she stayed another to 2 days to try her new bite, as she hadn't been able to eat properly for so long that she had to learn it. Her bite was set properly and she returned home with a full smile of happiness. Her hair loss and the pain in her shoulder have gone. She could leave the pain-killers alone.She is now able to eat properly, so her digestion problem has also gone.